I haven’t been blogging or journaling. I have a backlog of posts I want to edit and publish (and I still intend to), but obviously I’m not going to journal the past month and a half. I wish I had, because I learned a ton, but life was just too crazy. Hopefully my year-end review at work will make it all worth it. I was inspired to come back to the blog because of the incredible experience I had at a schooling show this past weekend. The short story is: it was all worth it. The money spent on training and lessons. The three years of work where it felt like we didn’t make any progress. The agonizing over training decisions, and the crying over failures. I made every effort this weekend to set myself up for success. This was our first show since Rob returned home from her dressage boot camp, and my first since I attended my own boot camp, and I wanted it to be successful. I wanted it to usher in a new era for our relationship – one where we like going to shows, where we’re successful at shows, and where we’re happy working together even away from home. So I hired my trainer to come coach us (a trainer! At a show! How novel! ), I planned to dress casually even in the show ring, and we trailered down the night before to school in the show ring. I also didn’t invite any family to watch, which explains my sad dearth of media. So we arrived the night before, something I’ve never done. She got on the trailer great – it was her first time on this particular trailer and she walked right on like it was her own stall. Portentous for the rest of the weekend, maybe? Immediately after unloading we tacked up to school. We were the only humans there and the farm was very dark. It’s a nice, large, showgrounds – probably six rings, plus a couple of warm-up areas. The stalls feel luxurious, the footing is always impeccable, and the farm is always spotless. It’s also where I showed as a kid, so it has a special nostalgia. It was the perfect environment for me to focus 100% on getting some decent work at a new location. And decent work was achieved! We had neither perfect roundness nor great forward, but we had enough of each that I was very pleased. My expectations have definitely been raised in the past few months – six months ago that late-night school would have been the best ride we ever had. We tucked the ponies into their stalls and headed to a very late dinner and an even later bedtime. But staying at a hotel nearby means a later start in the morning, apparently. Post-4:30, even! Why didn’t anyone ever tell me!? The morning of the show, Robbye was again well-behaved in her stall. No screaming, no anxiety, lots of eating and drinking and pooping. We tacked up and prepared for our first test – Training 1. And it went…alright. My trainer was preparing for her own ride so couldn’t coach us, which in hindsight was probably good for me to experience. Now I know what the difference is between my instincts and what Kim wants me to do, and I can actively work to warm up on my own the way that will get us the best work. So the first test was just okay. We botched a lead twice, which is weird, but I’m sure it was just a lack of forward and/or impulsion. That was the theme of the test – slow – though the judge didn’t seem to see it as much as I felt it. Robbye got to rest for an hour or so while I tried to get over my disappointment. That ride hadn’t been the incredibly overwhelming improvement I’d fantasized about. Where was the pride? Where was the glow in my stomach? Soon it was time to warm up for Training 2, and I headed with my entourage (showing with a trainer is so fun! You get a whole fan club, and get to be a part of a fan club for your teammates!) to the outdoor warm-up arena. Rob hadn’t been out here yet but I wasn’t worried; she was so well-behaved and quiet that we just..did it. We just warmed up. It was a mediocre warm-up, again, but it was fairly-round and fairly-forward, so I was content! Until she dumped me – right on my head. She even galloped away without checking to see if I was okay. Horses never do that in the Facebook videos! At this point I’m on the ground hyperventilating because I’m just. So. Upset. Sad, embarrassed, and overwhelmingly disappointed. Why have I been doing all this work? Why did I pay for all of the training and the new gear? Our boot camp was supposed to mean we wouldn’t humiliate ourselves at shows and events anymore – like we have been for the past two and a half years. I’m tired of having the crazy horse. I’m tired of falling off or of bucking across the dressage court. And yet here I am, crouched on the ground with a split lip, unable to catch my breath because of debilitating disappointment. I think I hit a turning point on the ground there, guys. Usually, I don’t get angry. Angry, for me, quickly turns to tears and humiliation and apologies. But this time, sitting in the sand, with everyone looking at me and with my ride time quickly approaching, I felt a fire start in my belly. My breathing slowed and the pain from the cut in my lip faded away. So I got back on and absolutely rode the snot out of the rest of our warm-up. And then I rode the snot out of the test, too. And as we trotted down centerline, the anger faded and the anxiety faded and the embarrassment faded, and all that was left was an overpowering, absolutely glowing sense of pride. I managed to hold back tears of happiness until we saluted the judge, and then I broke down in relief. We had nailed the roundness. We had nailed the forward. 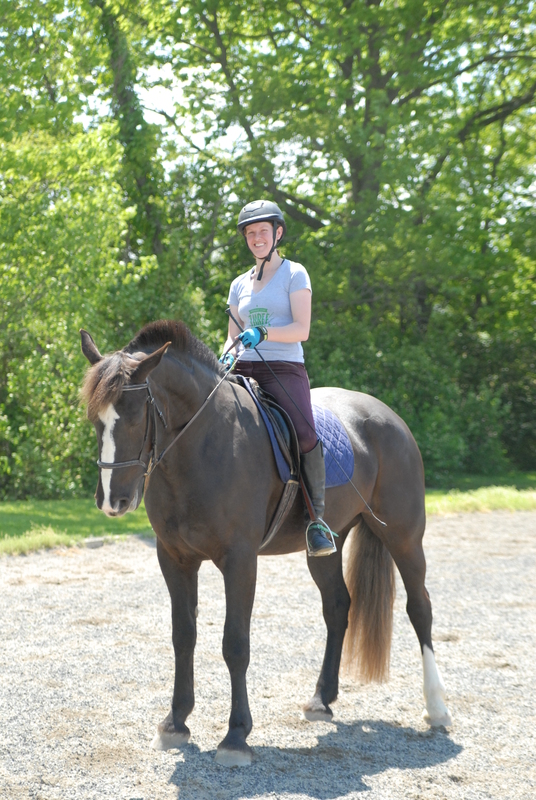 We had nailed the transitions and the geometry and that silly canter lead. I had anchored my seat in that saddle and she had said Yes ma’am and I had responded Good! This is what we’ve been working toward. This is what teamwork feels like. This is what submission and impulsion and rhythm and success feel like. And hey, apparently this is what winning feels like, too.